UPDATE 2: This update changes the Platinum aspiration effect from +200 to +500. This is because it is possible that if the sim has very low needs, achieving Platinum aspiration may not actually boost the sim's mood to 100, even though the UI would still show the sim's mood as platinum. This is because the game simply attempts to boost the sim's mood by +200, but with any additional negative effect, this final boost may be below 200. This simply makes it so that the game always sets the sim's mood to 100 when the sim has Platinum aspiration. UPDATE 1: This update is only for the Memory Version. This update makes the mod more efficiently check the sim's last 200 memories. In an unmodded game, a sim's mood is mostly calculated by checking the sim's needs. I really hate this. This is by far the worst thing in the Sims 2. Sims almost always have high mood, as it is so easy to satisfy needs, and as sims always try to increase their lowest needs. Because of this poor design, everything is very easy in this game. Social interactions always succeed, because everyone has high mood. 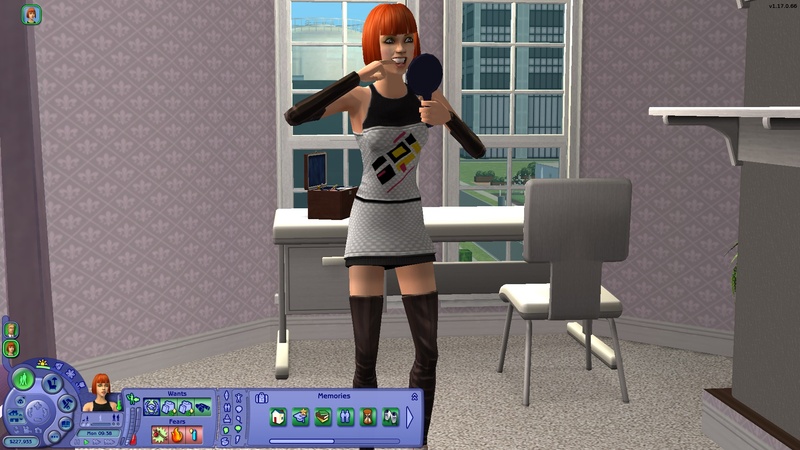 Job performance always increases greatly, because sims are almost always in a good mood when they go to work. Why is it that only Platinum aspiration has the ability to affect the sim's mood? I think sims who have red aspiration should be in a lower mood than usual. - Gold aspiration increases mood by +15. - Upper green aspiration increases mood by +5. - Lower green aspiration has no influence on mood. - Upper red aspiration decreases mood by -25. - Lower red aspiration decreases mood by -50. This is one of the simplest mods I have ever made, but it has had the most visible influence in gameplay. I love this mod, because it actually makes gameplay challenging. If your sim has red aspiration, this will effectively mean that they will gain much lower job performance when they go to work (and if their mood is in the red, then they will lose job performance), they will not be able to use skilling objects as often, they will find it much more difficult to accept any social interaction (including Sales socials), they will be much more likely to perform negative socials, and so on. Memory Version: It looks like Maxis originally intended memories to affect mood, too. So, positive memories would increase and negative memories would decrease the sim's mood. This was scrapped, and instead they added Wants and Fears and the Aspiration meter to the game. Sims 3 and 4 would take this idea of memories affecting mood in the form of moodlets and emotions. I think memories should definitely affect their mood directly, so I made this alternative version. The Memory Version is the same as the Regular Version, but has the following additional feature: the game also checks the sim's last 200 memories, adds the current strength of all those memories together and then divides the final value by 25. If the final value is higher than 25, it is set back to 25. If it is lower than -25, it is set back to -25. Then, the final value is added to the sim's mood. So, sims who have had recent positive memories will be in a better mood than sims who have had recent negative memories. Tuning: You can easily tune this mod. - Open this mod in SimPE, and click on the resource called "Mood Boosts". - Make sure you are in Plugin View below. You should see six lines going from "Very Bad" to "Gold". These refer to Aspiration levels. - Very Bad=Lower Red, Bad=Upper Red, Neutral=Lower Green, Bronze=Upper Green, Silver=Gold, Gold=Platinum. - Left-click on each and change the Dec number on the left side to how much Aspiration level should increase/decrease mood. Do NOT change the Gold entry, it should be set to 500. You can change the rest. Then, click on the Commit File button on the right. For example, you can set Silver to 0, Bronze to -5, Neutral to -10, and leave Bad and Very Bad at -25 and -50. This way, only Platinum aspiration can boost a sim's mood, Gold aspiration won't affect mood, and all other levels will decrease mood the lower the level is. - Open the Memory Version in SimPE, and click on the resource called "Sim - Mood Boost - Update". - Make sure you are in Plugin View below, find the line that says "Local 0x0005/Literal 0x0019", left-click on it and then click on the Pop-up Wizard icon on the right-hand side. - The bottom number, set to 25 by me, is the number that the final sum is divided by. The higher the number, the less effect memories have on mood. I recommend that you do not set this number lower than 25. So, you should only change this number to a higher one to make memories affect mood less. You should probably pick a number from 25 to 200. Requirements: It may work even in Base Game, but I can only guarantee that the mod will work if you have Apartment Life and M&G.